How can you be sure that the ring you order is exactly what you’re looking for? With this service you can do just that – and you can keep or return your silver sample ring as you wish. We will create a silver sample of any engagement, wedding or other ring you’re looking to purchase using high quality 925 sterling silver. If your chosen design features precious stones we will imitate the size, cut and colour but using AAA cubic zirconia (CZ) stones. These will either be all white or coloured, depending on your chosen design. By trying a ring that’s as close as possible to your chosen design, you or your loved one will be able to discover how it looks and feels, including the exact fit, the cut and size of the stone(s) and so on. If you like it, great – you can be sure that the real thing will be just what you’re after. If not, then you’ll have another chance to fine tune your chosen design (perhaps with input from both you and your intended) to ensure that you’re 100% happy. As for the silver ring, you have the choice of keeping it. It will make a lovely addition to any jewellery box, ideal for wearing on holiday or while playing sport, for example. Alternatively, you can return it to us in the pre-paid envelope and we’ll deduct the £97 cost from the purchase of your actual ring. Either way, you’re one step closing to ensuring that you have a ring that’s perfect in every way – and an everlasting symbol of your love. And if for any reason, you don’t want to go ahead with the original ring you had in mind, that’s ok too – you can either keep the silver ring or return it to us for a refund*. 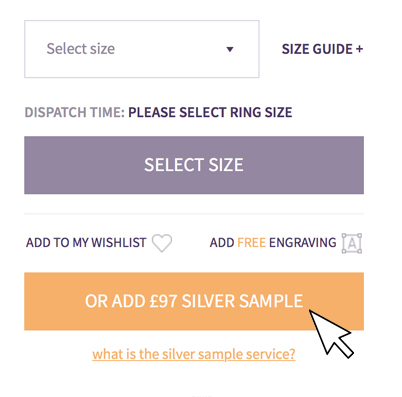 To order your £97 silver sample ring, simply submit your chosen design and click the box marked “Add silver sample”. Once ordered, your silver sample will be dispatched in approximately 20 working days. We hope you enjoy this unique opportunity and that your ring will be all you are looking for. And remember, you are free to keep or return your sample ring as you wish. *Please note that silver sample rings must be returned within 60 days of purchase if you would like a refund.